Weekend getaways with the family are a big part of how summertime memories are made. Grab the kids, an overnight bag, and hop in the car for a trip to Six Flags Fiesta Texas theme park in nearby San Antonio! 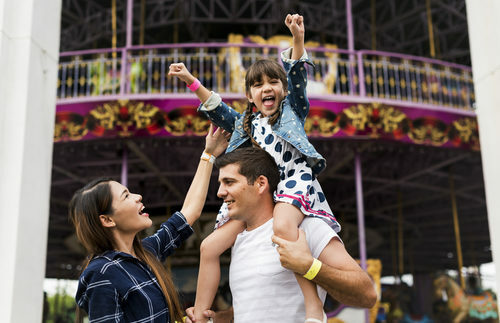 Six Flags Fiesta Texas boasts “the most thrilling rides on the planet” and they have something for everyone from little kids to the most adventurous kids-at-heart. One of the most popular rides is the Superman: Krypton Coaster which held the title for the world’s tallest vertical loop (145 feet) from its opening until 2013. It is also known for being the world’s tallest and fastest floorless coaster at 168 ft. high and a top speed of 70 mph. The new Batman: The Ride roller coaster is a 4D wing coaster and lifts riders up 120 feet, as well as providing flips, tumbles, and unexpected drops. Not into the thrill rides? Check out the carousel, Ferris wheel, train, tea cups, and bumper cars. Kids will love getting spooked on the Scooby-Doo Ghostblaster and zooming around on the Kiddie Coaster. Live shows are performed throughout the day, so be sure to get a schedule when you arrive. With a variety of entertaining themes, shows are a great break in the day from all that walking and waiting in line for rides. When you’re ready to cool down, head over to the water park and ride the waves in the half-million gallon wave pool shaped like the state of Texas. Then, float down the Mine Shaft slide adventure or get drenched on Gully Washer, a whitewater river rafting experience. The whole family can climb, slide, and splash in the Texas Treehouse, too. • Visit the most popular rides when the park first opens or after 5 p.m. When you’re ready to head back to The Woodlands, be prepared to hit some traffic on I-10 if you’re travelling on a Sunday afternoon or evening. Stopping for dinner at the half-way point of the drive might help to break up the car ride.